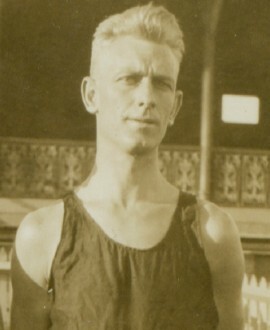 Former Collingwood speedster Bill Twomey Sr fulfilled a long-held ambition of winning the Stawell Gift in 1924, two years after giving up his VFL career to pursue his athletic endeavours. But Twomey’s Easter was not a total procession – he was soundly defeated in the 75-yard sprint by a young runner and would-be footballer. Nineteen-year-old Bert Everett upstaged his more fancied rival in the sprint, winning by six inches off a handicap of seven and a half. The sash he won was reward enough for Everett, but he also received a lucrative first prize of 20 pounds – a sizeable windfall for the fresh-faced Collingwood boot-factory worker. Everett was born in Brunswick, the youngest of eight children, and enjoyed numerous sporting pursuits as a teenager. While he had a solid, successful career as a professional foot-runner through the mid-1920s, the snowy-headed Everett – hence his nickname ‘Snowy’ – devoted much of his spare time to football. He joined Carlton in 1926 and was a member of the club’s reserves Premiership team that season. By 1928 he managed to break his way into the senior side but played only four games in two seasons, despite giving good service in the seconds. One of Everett’s idols as a young player was Carlton’s outstanding leader and footballer Ray Brew. Incredibly, the pair married sisters and became firm friends for life. But not even that connection could see him retained on the Blues’ list for season 1930. Rather than give up, Everett set his sights higher and transferred to Collingwood. Breaking into the Machine Team would almost certainly have been tougher than winning a game with the Blues, given the Magpies had won the past three Premierships and were coming off the most successful season in VFL history. To his credit, Everett managed four games in the year of Collingwood’s fourth successive flag. He made his black and white debut in Round 6 against North Melbourne at Victoria Park, where he played as follower and won praise from The Argus football reporter, who said he ‘showed promise’. The 179cm, 74kg utility also spent time on the wing and in the back pocket in his time at Collingwood. Fittingly, he played his final VFL game against his old side, Carlton, in Round 10. His brother-in-law was the captain of the opposition. Everett later played a few games with Preston in the VFA, and also enjoyed a number of different occupations over the years. He worked in the hotel industry, including a stint at St Kilda’s Prince of Wales. It was this industry and his connection with Brew that drew Everett to South Australia in 1952. The brothers-in-law had visions of opening up a number of new hotels in Adelaide. ‘Snowy’ Everett, the man who upstaged Bill Twomey in an undercard event at Stawell in 1924, would call Adelaide his home until his death in 1958, at age 53.